"We'll do what we always do, report the news." That's how Bob Schieffer, forever folksy and understated, promoted his final edition of "Face the Nation" in a tweet the other day. Schieffer, 78, will say goodbye on Sunday morning after nearly a quarter-century moderating CBS's marquee political talk program. The hour will include a big interview -- Jeb Bush -- and perhaps a torch-passing moment, since his successor John Dickerson will be a part of the program's roundtable. It has an end-of-an-era feel, but Schieffer's far too modest to buy into that premise. In a recent interview on the set of "Face the Nation," he said he's sure he will miss "being in the middle of things," but equally sure that the time is right for his retirement. "I wanted to leave while I thought I could still do the job," he said. "I mean, I have seen too many people in Washington that have to be sort of led by the hand off the stage, as it were." He chuckled. "And I didn't want to be one of those guys. CBS is doing very well these days. 'Face the Nation' is doing well. And I thought this is just a good time to do it." 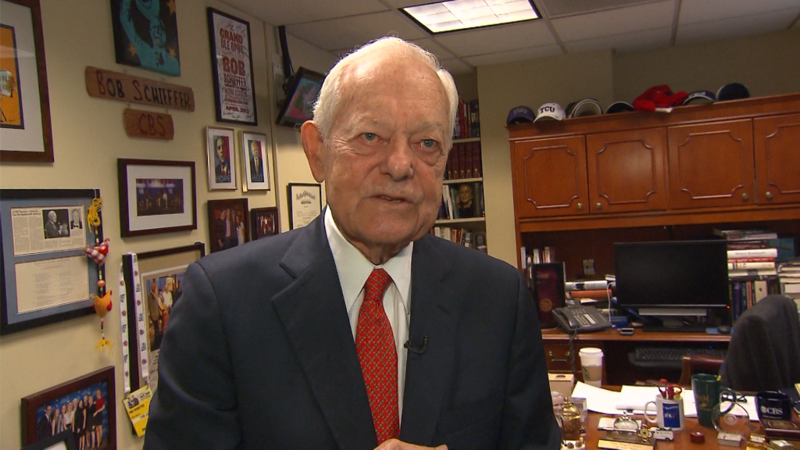 Schieffer's not sure what he will do next. But he definitely wants to spend some more time at his alma mater, Texas Christian University, where the journalism school bears his name. Schieffer has a teacher's love for journalism, and the ability to make even the most cynical listener love it too. "I've wanted to be a reporter since I was in the eighth grade," he said. "And I got to be one!" A lot of people, he pointed out, don't get that chance to follow through on their childhood dream. Schieffer's very first paying job in journalism was a night shift at the Fort Worth, Texas radio station KXOL. He was 20 years old and still taking classes at Texas Christian. "I just liked being where the news was, knowing about it before other people did and telling them about it before someone else could," he wrote in his 2002 memoir "This Just In." After a period as an Air Force public information officer, Schieffer was hired by the Fort Worth Star-Telegram to cover the police beat, 6 p.m. to 2:30 a.m., for $115 a week. He still recalls the job fondly. "I'll always believe that being a police reporter is the single best experience you can have, for any job in journalism," Schieffer said in the interview. Dealing with the authorities, seeing gruesome crime scenes, interviewing victims of trauma, writing stories on deadline -- "if you can keep your wits about you," he said, "and remember which questions you should ask in those circumstances, you're not going to be cowed by some spin doctor or politician." On the police beat, Schieffer fancied the role of investigator and sometimes rode with detectives to crime scenes. He wrote in his memoir that reporters back then had "such a close working relationship with the police that we often took confessions from criminals." These days, such coziness between journalists and their subjects is often decried, particularly by outsiders who say it's a serious problem in Washington. Schieffer, who NPR called "equal parts folksy inquisitor and experienced political insider," doesn't subscribe to that view. For one thing, "I don't think there's nearly as much coziness as there used to be," he said. And "I kind of like it when you have good relations." "I've heard people say, 'Well, you go to all these parties together.' Let me tell you something," he said, leaning in. "I have never gotten one single story at a party. I have never, in a social setting, ever gotten a story that ever amounted to anything. You know where I got the stories that I got? When you call up the same people every day and ask them the same questions. 'Is anything going on over there?' "
In other words, beat reporting. After being hired by CBS in 1969, Schieffer worked all the major beats in Washington -- the Pentagon, the White House, the State Department, Capitol Hill. He's also been a weekend news anchor for most of his 46 years at CBS, and the moderator of "Face the Nation" since 1991. In the interview, he expressed two big worries about the state of journalism, both of them relating to the decline of newspapers. When he commented that "I don't know where reporters are going to work in the future," he quickly added, "I hope a lot of them will work in newspapers." The first worry was about a "de-emphasis on beat reporting," the kind that requires daily phone calls and close relationships with sources. The second was about the devaluing of the role of editors. They are there "for your protection," he said, but many young journalists working for digital news operations don't have that kind of supervision. "My editors taught me how to write a story; taught me what questions to ask; and when I made a mistake, they were there to correct me," Schieffer said. "And I think that's one of the reasons there's so many problems now in journalism. It's not that the reporting is not as good as it used to be, but it's the lack of really strong editors." Despite his optimism about being a journalist, Schieffer showed some pessimism about the quality of digital journalism, saying it's "harder now than it's ever been" to get accurate information. "We're just overwhelmed by news," he said. "There's so much news that we can't get to the news!" Traditional mainstream media decision-making, the daily picking and choosing of stories, is the antidote, he believes. 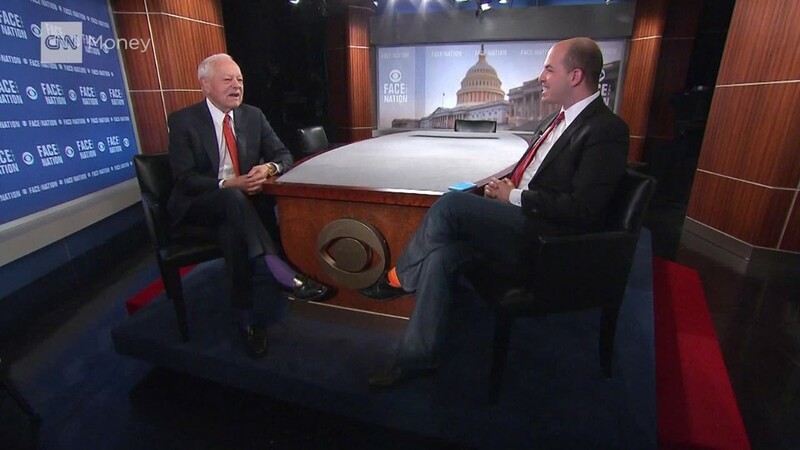 Will Schieffer remain with CBS in some fashion once he signs off from "Face the Nation?" Retiring anchors often remain part-time contributors at their respective networks, but Schieffer said he didn't know if he would. He did make clear, however, that he wouldn't go to work for one of CBS's rivals. There's no journalism job he has yet to try, no next rung on the ladder. Toward the end of the interview, he sounded beautifully content with his career. "What else could I have done, that I would get a chance to do what I've done and see what I've seen and talk to the people I've talked to? It just doesn't get much better than this, as far as I'm concerned."